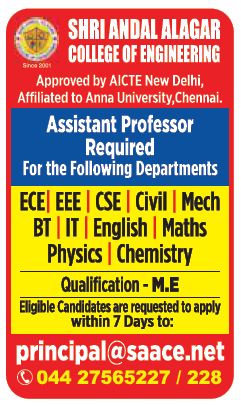 Shri Andal Alagar College of Engineering, Mamandur has advertised in THE HINDU newspaper for recruitment of Assistant Professor jobs vacancies. Interested and eligible job aspirants are requested to apply within 07 days from 14th April 2019. Check out further more details below. About College: Shri Andal Alagar College of Engineering (SAACE) was established in the year 2001 by Shri Andal Alagar Educational Trust with the noble aim "To provide Technical Education to the poor and downtrodden at an affordable cost". The founder of the trust is a popular film star, philanthropist and a leading Politician of Tamil Nadu Thiru Puratchi Kalaignar Vijaykant.is an Educational Institution for excellent Learning and is functioning under the auspices of Shri Andal Alagar Educational Trust with the motto of "LEARNING IS LIMITLESS" SAACE is located near Chengalpet about 60km away from Chennai and in Chennai –Tiuchirapalli National highway (NH45). The college is approved by AICTE, New Delhi affiliated to Anna University, Chennai and Accreditated by NBA. The college has very good infrastructural facility, equipped laboratories, hostels, transport, sports complex etc. to provide good study ambience to the students.